There is a lot of talk about "the cloud" today - and most of it makes it sound as simple as buying a ticket to a concert. Buy your ticket, then sit back and enjoy the show. The truth is that it is much more like assembling an orchestra one instrument and one player at a time - with you playing the role of conductor. Your future is in the cloud - there is no avoiding it. This means that you will be managing a complex ecosystem of providers that you must turn into an orchestra. This brings both great risk and great opportunity. 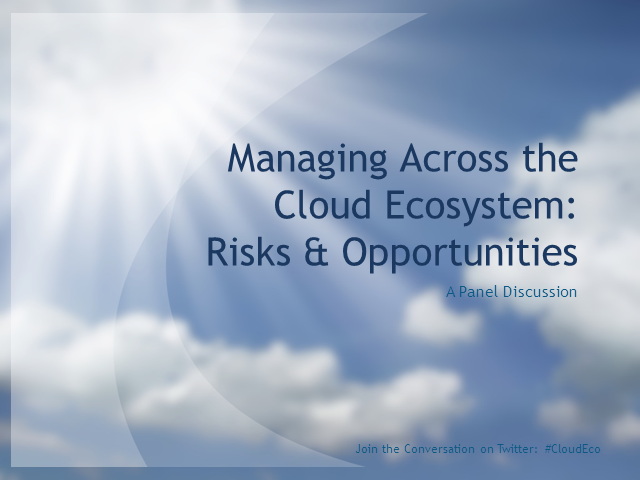 In this panel discussion, we will bring together some of the world's foremost experts on the cloud to discuss how to avoid the risks and seize the opportunities that will present themselves as you build and manage your cloud ecosystem.